In Dot blot detects 50ng of mono-acetylated peptide corresponding to position Lys9 in the N-terminal sequence of Histone H3. Does not detect the mono-acetylated peptide corresponding to acetyl-lysine at position 14 or unacetylated Histone H3. Synthetic peptide corresponding to Human Histone H3 aa 1-12 (acetyl K9) conjugated to Keyhole Limpet Haemocyanin (KLH). Learn about ChIP assay kits, other ChIP antibodies, protocols and more in the ChIP assay guide. Abcam recommended secondaries - Goat Anti-Rabbit HRP (ab205718) and Goat Anti-Rabbit Alexa Fluor® 488 (ab150077). 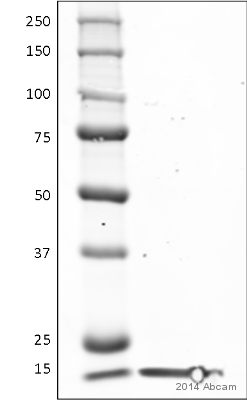 See other anti-rabbit secondary antibodies that can be used with this antibody. Our Abpromise guarantee covers the use of ab4441 in the following tested applications. Detects 50ng of mono-acetylated peptide corresponding to position Lys9 in the N-terminal sequence of Histone H3. 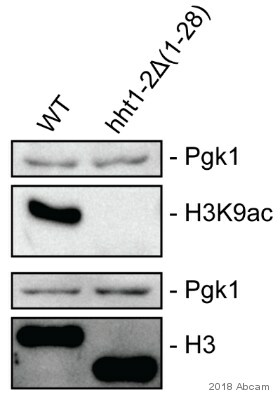 Does not detect the mono-acetylated peptide corresponding to acetyl-lysine at position 14 or unacetylated Histone H3. WB 1/10000. Detects a band of approximately 17 kDa. Chromatin was prepared from U2OS cells according to the Abcam X-ChIP protocol. Cells were fixed with formaldehyde for 10 min. The ChIP was performed with 25 µg of chromatin, 2 µg of ab4441 (blue), and 20 µl of protein A/G sepharose beads. No antibody was added to the beads control (yellow). The immunoprecipitated DNA was quantified by real time PCR (Taqman approach). Primers and probes are located in the first kb of the transcribed region. 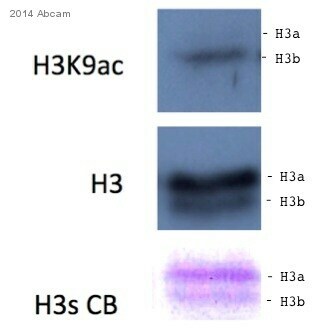 ChIP - Anti-Histone H3 (acetyl K9) antibody - ChIP Grade (ab4441)This image is courtesy of an Abreview by Brian Segan. ChIP analysis using unpurified ab4441 binding Histon H3 in human primary CD34+ cell lysate. Cells were cross-linked for 15 minutes with 1% formaldehyde. Samples were incubated with primary antibody (0.2 µg/µg of chromatin) for 16 hours at 4°C. 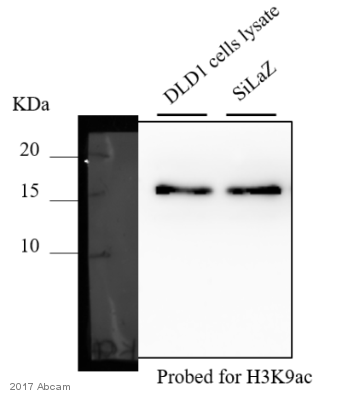 Protein binding was detected using real-time PCR. Region upstream of the transcription start site of the ACTB gene. Region upstream of the transcription start site of the EGR1 gene. Region on chromosome 12 (Untr12) that is far from any known gene annotation and not expected to be bound by Histone H3 (acetyl K9). 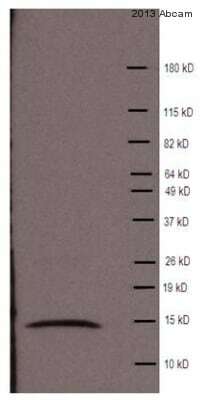 Western blot - Anti-Histone H3 (acetyl K9) antibody - ChIP Grade (ab4441)This image is courtesy of an anonymous Abreview. Lane 2 : Mouse MEL cell nuclear lysate treated with 0.4 µM Trichostatin A treatment for 18 hours. Lysates/proteins at 9 µg per lane. 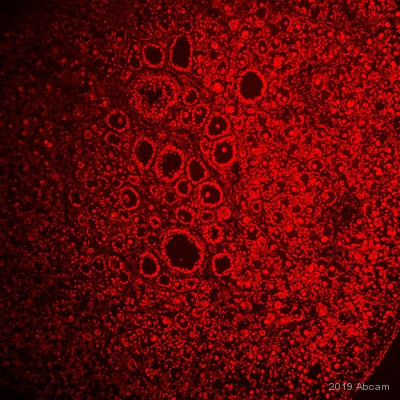 Immunocytochemistry/ Immunofluorescence - Anti-Histone H3 (acetyl K9) antibody - ChIP Grade (ab4441)This image was submitted as part of a review by review by Anita Ciurciu. Fruit fly (Drosophila melanogaster) Cell (polytene chromosomes) were fixed in formaldehyde, blocked in 1% BSA for 30 minutes and incubated with ab4441 (1/100) for 12 hours. Publishing research using ab4441? Please let us know so that we can cite the reference in this datasheet.